TBS The Book Service Ltd. Hardcover. GOOD. Spine creases, wear to binding and pages from reading. May contain limited notes, underlining or highlighting that does affect the text. Possible ex library copy, thatâll have the markings and stickers associated from the library. Accessories such as CD, codes, toys, may not be included. Crown Publishing Group, 1973. Hardcover. Good. Disclaimer:A copy that has been read, but remains in clean condition. All pages are intact, and the cover is intact. The spine may show signs of wear. Pages can include limited notes and highlighting, and the copy can include previous owner inscriptions. The dust jacket is missing. At ThriftBooks, our motto is: Read More, Spend Less. Crown Publishing Group, 1973. Hardcover. Acceptable. Disclaimer:A readable copy. All pages are intact, and the cover is intact. Pages can include considerable notes-in pen or highlighter-but the notes cannot obscure the text. At ThriftBooks, our motto is: Read More, Spend Less.Dust jacket quality is not guaranteed. Crown Publishing Group, 1973. Hardcover. Acceptable. Disclaimer:A readable copy. All pages are intact, and the cover is intact. Pages can include considerable notes-in pen or highlighter-but the notes cannot obscure the text. The dust jacket is missing. At ThriftBooks, our motto is: Read More, Spend Less. Crown Publishing Group, 1973. Hardcover. Good. Disclaimer:A copy that has been read, but remains in clean condition. All pages are intact, and the cover is intact. The spine may show signs of wear. Pages can include limited notes and highlighting, and the copy can include previous owner inscriptions. At ThriftBooks, our motto is: Read More, Spend Less.Dust jacket quality is not guaranteed. Quadrangle Books. Hardcover. 0812903099 Ships promptly from Texas. . Good. 1973. TBS The Book Service Ltd. Hardcover. 0812903099 Ships from Tennessee, usually the same or next day. . Fair. 1973. Quadrangle Books. Hardcover. 0812903099 . . Fair. 1973. Quadrangle Books. Hardcover. 0812903099 Ships promptly from Texas. . Fair. 1973. Quadrangle Books. Hardcover. 0812903099 . . Good. 1973. Quadrangle Books. Hardcover. 0812903099 Ships promptly from Texas. . Very Good. 1973. Quadrangle Books. Hardcover. 0812903099 Good Condition. Has tearing and some staining on dust jacket. Five star seller - Buy with confidence! . Good. Quadrangle Books. Hardcover. 0812903099 Missing dust jacket. Acceptable Condition. Five star seller - Buy with confidence! . Fair. 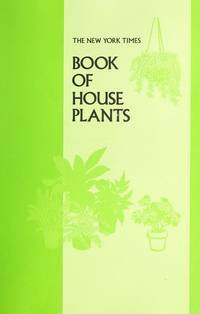 NY: Quadrangle Books, 1973 A Thorough discussion of plant craft is given with instructions for growing over 100 popular house jplants, each illustrated with a delightful watercolor rendering. Soil mixtures, humidity, temperature, light, water, fe4rtilizer, pruning, potting, new agricultural developments, problem locations, what to do when you go away, are covered. TBS The Book Service Ltd. Used - Good. Ships from Reno, NV. Shows some signs of wear, and may have some markings on the inside. 100% Money Back Guarantee. Shipped to over one million happy customers. Your purchase benefits world literacy! TBS The Book Service Ltd. Used - Good. Shows some signs of wear, and may have some markings on the inside. New York: Quadrangle Books, 1973. Seventh Printing, as stated. Hardcover. Near Fine/very good. DJ has a very small tear and has some slight edge wear. Book shows some slight ssigns of reading. 23 To qualify for refund (including original shipping cost) less $1.00, book(s) must be returned within 15 days. Random House, 1973. Unabridged. Hard cover. Good in fair dust jacket. The New York Times Book Co., New York: 1973. Hardcover with dustjacket. Good condition but. dustjacket is worn. This book is offered with the certainty that you will find information which will help you make your plants grow and flourish. Includes an index. ISBN: 0812903099.